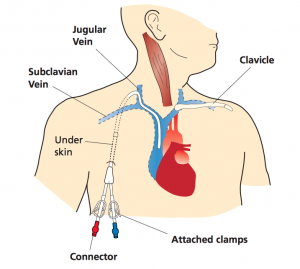 A Hickman line is a hollow tube that is inserted into the jugular vein (the main vein you normally check your pulse from in your neck) and into the superior vena cava (the main vein entering your heart). The other end lies outside the body. This end is split into two separate lines. They do this so you can be given two different treatments at the same time. There is a cuff (small disc shaped object) attached in the middle of the tube (just under your skin) keeping the line in place and is used as a barrier to infection from the outside. Sorry for being super technical but there isn’t really another way to describe it. 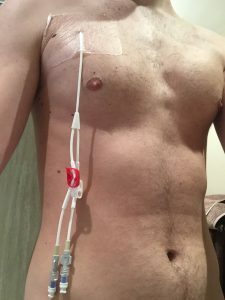 I did not have a clue what a Hickman line was before I had my treatment. It was a lifesaver, literally a lifesaver. It is amazing what you learn. By the end of treatment I felt like I could have been a doctor.